1-You Wash-Self Serve No appointment necessary! 2-We Wash Drop-Off Service-Includes wash, dry, coat conditioning, ear cleaning, eye wipes and brush out. Either while you wait or we will call you as soon as your dog is done. Drop-in is first come first served and typically take 2-3 hours. 3-Professional Grooming by appointment. Any dogs that require a haircut or have excessive shedding would require an appointment with one of our groomers. Call or text 508-533-2833 to request an appointment. 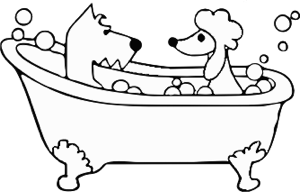 The Area’s Only Self-Service and Pro Grooming Dog Wash!! No Appointment necessary. Please no drop offs after two hours before closing.